Fig. 5.3. Scanning electron micrograph of Mixotricha paradoxa. The white line indicates the borderline between the anterior and posterior part of the cell, which are colonized by different spirochete clones. The larger spirochete cells of the anterior part are only loosely associated and not tightly bound to the cell surface (from Wenzel et al. 2003; with permission). Bar 100 |m of spirochetes with the exception of the posterior ingestive zone (Cleveland and Grimstone 1964). 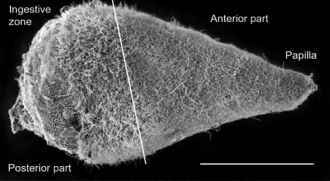 The rod-shaped bacteria and the spirochetes are attached to regularly arranged protrusions of the cell surface. Interestingly, Cleveland and Grimstone (1964) found that the spirochetes (not the relatively small four flagella) propel the cells. It is still unknown how the flagellates and the spirochetes communicate and coordinate the direction of movement. For hydro-mechanical reasons, it seems that cilia, flagella, sperm tails and spirochetes should automatically synchronize their movement when undulating in close proximity (Machin 1963). So far, it is not possible to cultivate either Mixotricha paradoxa or its ectosymbiotic spirochetes and rod-shaped bacteria. 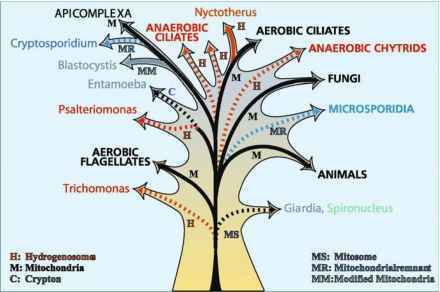 Although spirochetes are always a dominant part of the microflora of all termites (Margulis and Hinkle 1992), only four species have been obtained in pure culture (Leadbetter et al. 1999; Dröge 2006). Spirochetes possess a cellular ultrastructure that is unique among eubacteria (Holt 1978; Canale-Parola 1991). The helical protoplasmic cylinder is encased by an outer envelope, which has some features analogous to the outer membrane of gram-negative bacteria. The spirochetes possess internal organelles of motility called periplasmic flagella, which are located between the protoplasmic cylinder and the outer envelope (Paster et al. 1996). Previously, several spirochetal 16S rDNA sequences originating from the hindgut of Mixotricha darwiniensis were published (Berchtold et al. 1994; Berchtold and König 1996; Wenzel et al. 2003). These clones also represent species from a side branch of the Treponema cluster (Lilburn et al. 1999; Ohkuma et al. 1999). Two additional spirochete clusters related to the genus Spirochaeta have been found recently (Dröge et al. 2006).